Khammouane or Khammouan (Lao: ຄໍາມ່ວນ) is a province of Laos, located in the center of the country. Its capital lies at Thakhek. Khammouane Province covers an area of 16,315 square kilometres (6,299 sq mi) and is mostly of forested mountainous terrain. The province is bordered by Bolikhamsai Province to the north and northwest, Vietnam to the east, Savannakhet Province to the south, and Thailand to the west. Many streams flow through the province to join the Mekong River. The vast forests of the Nakai-Nam Theun Biodiversity Conservation Area are an important watershed that feed many Mekong tributaries as well as form the catchment area for Nam Theun 2, the largest hydropower project in Laos. The Xe Bangfay, Nam Hinboun and Nam Theun are the main rivers of the province. Part of the aborted Thakhek - Tan Ap railway would have crossed the province to connect with the North-South Railway at Tân Ấp Railway Station, Quảng Bình Province, Vietnam through the Mụ Giạ Pass. Khammouane Province, one of the provinces of Laos, covers an area of 16,315 square kilometres (6,299 sq mi) and is mostly of forested mountainous terrain. The province is bordered by Bolikhamsai Province to the north and northwest, Vietnam to the east, Savannakhet Province to the south, and Thailand to the west. Many streams flow through the province to join the Mekong River. Some of the major rivers which originate in the mountains of this province are the Xebangfay River (239 kilometres (149 mi) long), Nam Hinboun, Nam Theun and Namgnum River. Situated between the Mekong and the Annamite Range, the Khammoun Plateau features gorges, grottoes, jungles, limestone hills, and rivers. 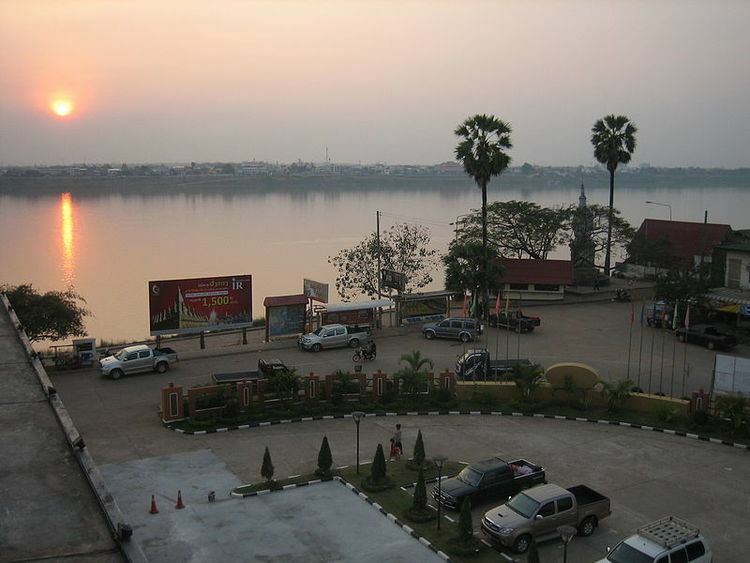 Thakhek, the provincial capital, is situated along the bank of the Mekong River. It borders Thailand; the border check post is Nakhon Phanom in Thailand. The city has many buildings designed in the French colonial architectural style. The third Friendship Bridge opened to traffic on 11 November 2011 across the Mekong River. It is a major link between Thakhek city in the Khammouane Province and the Nakhon Phanom Province in Thailand. The bridge is 1,423 metres (4,669 ft) long and 13 metres (43 ft) wide. Tham Khonglor Cave (meaning: “Beauty in the Dark”) is part of the Nation Protected Forest Area in Hinboun Mountain. Its west entrance is from Ban Khonglor village in Hinboun District, while the east entrance is from Ban Natan village, Nakai District. The cave runs for a length of about 7.4 kilometres (4.6 mi) and its width varies from 10 metres (33 ft) to 90 metres (300 ft). Its height is in the range of 20 metres (66 ft) to 100 metres (330 ft) and the Hinboun River flows through the cave perennially. Vang That and Had Xay Luang are the two hanging rock formations in the cave. Had Xay Luang is a white sand beach here, of about 150 metres (490 ft) in length and 100 metres (330 ft) width. The cave is approachable along two routes, one from Vientiane along Route 13 to Hinboun District, and the second route is by boat along the Hinboun River. The province's forest areas consists of three reserve areas. 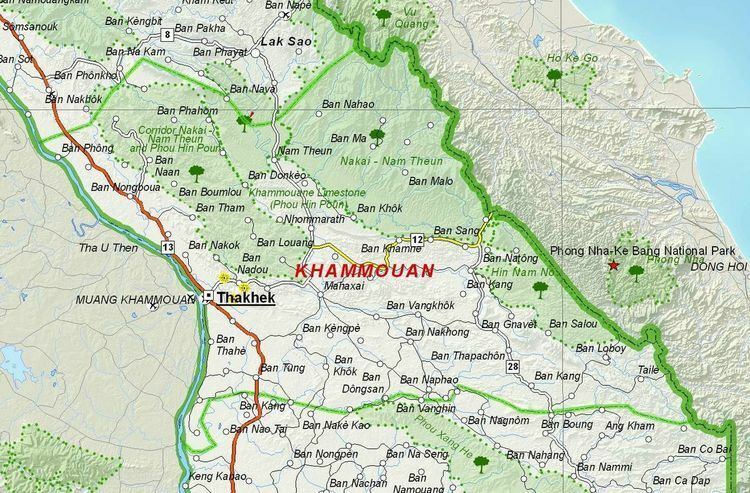 These are the Nakai - Nam Theun National Biodiversity Conservation Area (NBCA), which covers an area of 352,200 ha of the Annamite mountains and the adjacent Nakai Plateau in the provinces of Khammouane and Bolikhamxay, the Hin Nam No National Biodiversity Conservation Area with an area of 86,229 ha, and the Phou Hin Poun National Biodiversity Conservation Area with an area of 150,000 ha. These forests have many natural caves. Species of mammals, some discovered relatively recently, include the following (Robichaud 2005): saola, giant muntjac, Roosevelt's muntjac, Truong Son muntjac, Indochinese warty pig, Heude's pig, Annamite striped rabbit, Javan rhinoceros (Rhinoceros sondaicus annamiticus), Indochinese tiger, and Asian elephant. The 68,125 hectare Hin Nam No (also Hin Namno) Important Bird Area (IBA) is within the Hin Namno NBCA. Its topography features limestone karst outcrops, undulating limestone hills, as well as valleys. The IBA's habitat is characterized by sparsely vegetated limestone karst, semi-evergreen tropical rain forest, mixed deciduous forest, moist deciduous tropical forest, and wet evergreen forest. Crested argus (Rheinardia ocellata) and Austen's brown hornbill (Anorrhinus austeni) are classified as near threatened. The inornate squirrel (Callosciurus inornatus) has been identified as important fauna within the IBA. The Khammouane IBA is situated within the Phou Hin Poun NBCA. 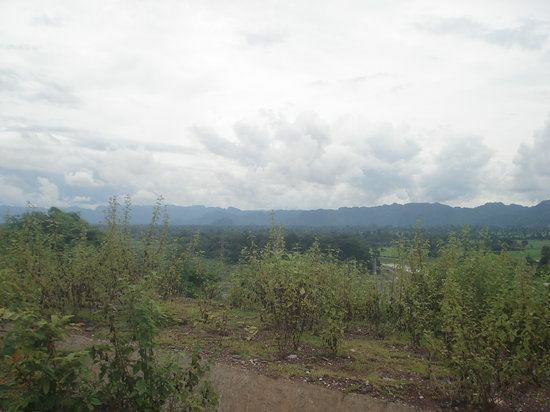 The IBA is 79,000 ha in size and its altitude is 200–900 metres (660–2,950 ft) above sea level. The topography and habitat are characterized by sparsely vegetated limestone karst, semi-evergreen forest, mixed deciduous forest, as well as non-calcareous substrate. The IBA is notable for supporting the sooty babbler (Stachyris herberti) and a taxon of François' langur (Trachypithecus francoisi). The population of the province according to the 2005 census is 337,314. Thakhek, the provincial capital, is an important centre for trade. Along with Bolikhamsai and Savannakhet provinces it is one of the main tobacco producing areas of Laos. Part of the province, particularly Yommalath District, was badly affected by floods caused by heavy rain in July 2011, affecting rice farmland in the district, inundating almost 700 hectares, destroying dozens of fishponds and killing 112 cattle. There are several major operating mining companies in the province, including Mining Development Economy Corporation mining gypsum in Thakhek District, LAVICO Co. Ltd, which is a Laos-Vietnam joint venture mining gypsum in Xebangfay District, V.S.K. Co. Ltd mining limestone in Thakhek District), and Lao-North Korea Tin Mines mining tin in Hinboun District. Several culinary specialties are also native the province including Kha Nom Phane, a type of rice cake. That Sikhottabong, also known as Sikhottabong Stupa, is contemporary to That Inhangin Savannakhet and That Phanom, built in Thailand under the Sikhottabong Empire. The bones of Lord Buddha are said to be consecrated in these temples. King Nanthasene built the stupa for King Soummitham. It was refurbished in the 15th century during the reign by King Saysethathirath. The stupa has four squares with each side measuring 25,030 metres (82,120 ft) long and its base is 14.33 square metres (154.2 sq ft) and rises to a height of 29 metres (95 ft). The pinnacle appears in the shape of the banana flower. The stupa is seen on the bank of the Mekong River. The festival held at this location is during the third month according to the lunar calendar. The Great Wall, built of stones, starts on the west side of Thakhek. It is 8 kilometres (5.0 mi) from the city, on Route 13. It extends from the Namdone River and its total length is about 15 kilometres (9.3 mi). Some sections of the wall are seen in Thakhek also. Its construction is attributed to the period of the Sikhottabong Empire in the 19th century and is now proposed to be preserved as a national heritage site. Other attractions include: Tad Kham Waterfall (about 52 kilometers away from Thakhek District), Tad Nam Khengkam Waterfall (about 37 km away to the east of Thakhek District), Wat Pha Sokkhamsene Temple (an old temple near Nongbok District and about 37 km from Thakhek District), and That Thumphavang Stupa (to the north of Nongbok District).